Come stand up paddle (SUP) with us and learn more about this easy to learn and increasingly popular sport! You’ll gain key paddling and board handling techniques and see Waikiki from a whole new perspective. 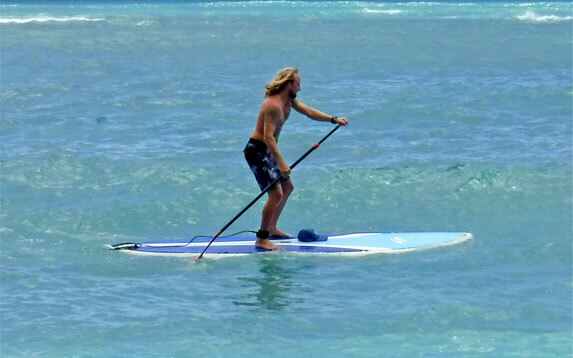 SUP is a great form of exercise, and is ideal for all ages and abilities. Book Private 1 student per 1 instructor. You’ll learn the fastest with private instruction! Book Semi-Private 2 students per 1 instructor – SUP with a family member, friend, or colleague. 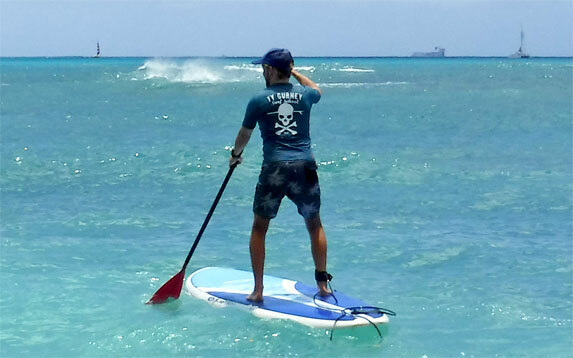 A great time SUPing and tons of fun with the best instructors in Hawaii! We encourage you to arrive at our shop 15 minutes ahead of your lesson time so we can get you checked in. (You may store your belongings in the shop while you’re taking your lesson.) We’ll take the 30 second walk to the beach, where your instructor will start with an introductory land lesson to review basic skills (board handling, paddling technique, getting to your feet and maintaining balance) and water safety. We’ll then get right in the water and start paddling away! The rest of your lesson will be spent fine-tuning your paddling technique, turning and stopping your board, and learning all about SUP etiquette and ocean knowledge. All lessons will be tailored to your skill level. Once your lesson is done, we’ll paddle back to the beach and walk back to the shop, where you may pick up your belongings (and schedule your next lesson!). All surf lessons include SUP boards, paddles, and rashguards; you’re welcome to bring your own rashguard if you wish. (For sun protection, we strongly encourage all students to wear a long sleeve rashguard.) We recommend bringing at least a towel and sunscreen – and to apply sunscreen everywhere, especially to your legs. Personal belongings that you won’t need with you in the water (bags, flip flops, change of clothes, etc.) may be stored at the shop while you’re in the water. Where Will I Be Paddle Boarding? For beginner paddlers, we’ll take you out in Waikiki’s calmest waters – this will help you quickly find your balance and get your paddle going. Our SUP lessons emphasize paddling technique, so your instructor will take you to calm, open stretches of ocean and avoid the surf zones. Your instructor will be one of the amazing members of our Ty Gurney Surf School team. All of our instructors maintain current CPR, Ocean Lifeguard, and First Aid Certifications, and are highly qualified to deliver first-class SUP instruction for all abilities. Parties of 2 that wish to SUP together may book 2 private lessons or 1 semi-private lesson. For example, if you and a friend would like to SUP together at 9am, you may book 2 private lessons at 9am, or you may book 1 semi-private lesson at 9am. Because Ty Gurney Surf School emphasizes personalized, individual instruction, we do not book more than 2 students per 1 instructor. To get your group paddling together at the same time, you may book multiple private or semi-private lessons. For example: Your party of 4 may book 4 private lessons at 9am, or your party of 4 may book 2 semi-private lessons at 9am. If you have a large group, please contact us to discuss the best options for you. For safety and insurance purposes, children age 14 and under must take a private SUP lesson (1 student per 1 instructor). For even more helpful SUP lesson tips, please visit our FAQ. REAL SUP INSTRUCTION. Ty Gurney Surf School has the lowest student-to-teacher ratios anywhere in Waikiki. We book no more than 2 students per instructor to ensure that every minute of your time with us is spent paddling and learning key stand up paddle skills. You’ll have an unforgettably fun time while gaining new SUP techniques and greater ocean awareness. We put safety first without sacrificing fun! All instructors maintain current CPR, Ocean Lifeguard, and First Aid Certifications. Our team’s experience and expertise as both skilled SUPers and professional instructors ensures that you’ll be paddling and learning with the best. REAL SURF SHOP. We’re proud of our shop! Having a physical location allows us to make a Ty Gurney Surf School lesson into a more convenient and fun experience for you. We’re a 30 second walk to the beach where you’ll be stand up paddling. You’ll meet here for your lesson, store your belongings while you’re in the water, and you’ll be able to grab a drink, dry off, and change afterwards.